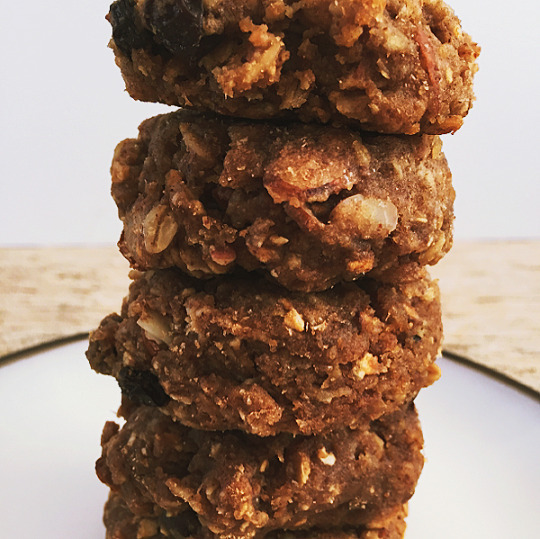 Apple Cinnamon-Raisin Trail Cookies – A Healthy Pinch. The base for these cookies comes from Oh Ladycakes and I cannot tell you how many times I’ve made some variation of them. They have been a breakfast staple not only in our home but from road trips to the hospital stay when our son was born. And now they have a special place in my heart. So, when I saw that Ashlae made a version with banana and banana chips, a lightbulb went off in my head, which leads us to this version below. I would loosely use the term cookie for this adaptation because they are moist and dense, almost cake-like. Made with oats (& oat flour), almonds (& almond butter), these will keep you full and energized all morning long! We almost always have a large bag of apple chips in our pantry because they are unusually sweet, though contain no added sugar, taste delicious and a great treat for our little morkie. So instead of bananas, we use apple chips and applesauce. And cinnamon. And raisins. And even though it seems like it’s perpetually summer here in NorCal, these cookies feel like a big bite of fall in your mouth. I was lucky enough to have some Califa Farms’ Cinnamon Horchata on hand and used that instead. Simply place apple chips in a food processor or blender and process until they turn into a fine meal. 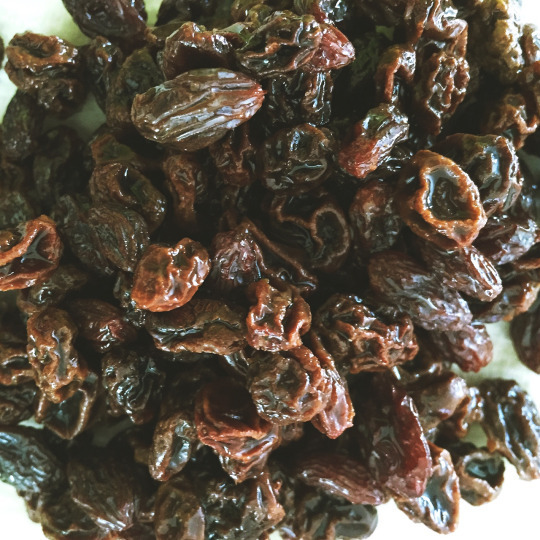 Place raisins in a small bowl and cover with water. Let them sit for about 15 minutes to plump up while you get the rest of the ingredients together. In a large bowl, whisk together the applesauce, almond butter, maple syrup and coconut oil until combined. Then whisk in the almond milk. Now it’s time for the dry ingredients. Add the oat flour, sea salt, baking soda, rolled oats, quick-cooking oats, apple chip meal and raisins. Stir everything together with a wooden spoon until all dry ingredients are evenly distributed. Cover bowl with cling wrap and refrigerate for at least an hour. Preheat oven to 325 degrees and line a baking sheet with parchment paper. Using a ¼ cup cookie scoop, drop the dough onto cookie sheet, roll between your hands into a ball, then flatten with the palm of your hand. They will not rise so doing this is essential. Top with a few raisins or apple chips if desired. Bake for 14-15 minutes, then transfer to wire rack to cool completely. They should keep for up to 5 days in an airtight container. **Note: the original recipe calls for the use of oat flour, which works extremely well. I wanted to play around with the flour combinations and settled on oat and spelt. Use all oat flour if you wish.